This gorgeous Aquilegia deserves a prominent spot in the garden! Just look at those double petals and the striking contrast between the dark purple and white is dazzling! A clump-forming perennial with almost fern-like, grey-green foliage. Aquilegia comes from the Latin word for eagle which refers to the flower's five spurs that resemble an eagle's talon. Its lightly fragrant flowers, on slender erect stems, contrast nicely with its blue-green foliage. 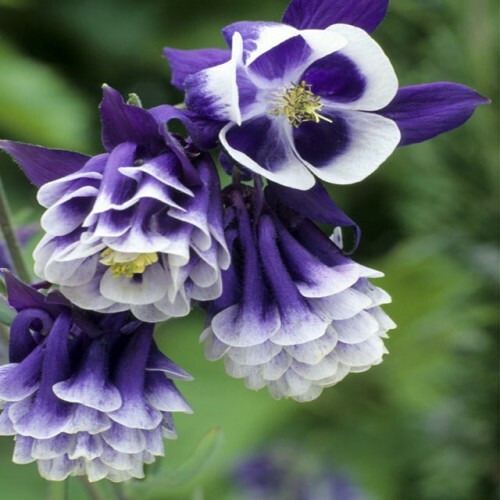 The common name, columbine, means dove-like, and the flower was often depicted in medieval paintings to represent the dove of peace. These little woodland perennials are enchanting when allowed to naturalize in a shady border.